Aquaculture Feed - Kepley BioSystems Inc.
Over the last fifty years, population growth has increasingly challenged the global food supply. By 2050, the world’s population is estimated to be 9.1 billion, 34% greater than today. Fish-based protein is vital for global food security and human nutrition, providing some 4.5 billion people with nearly 15% of their average intake of animal protein. According to the Food and Agriculture Organization of the United Nations, as urbanization continues and developing countries grow exponentially, income levels will steadily rise, and food production will need to increase by 70%. Accelerating these trends, the preferred diets in developing countries are shifting from traditional grain and rice-based sources to animal proteins. Economically, aquaculture is the world’s fastest growing food sector with a market value of $160 billion and expected compound annual growth rate of 2.5% until 2030. Between 1990 and 2010, fish and shellfish aquaculture increased at an annual rate of 7.8% worldwide, notably greater than the rates for poultry, pork, dairy, beef, and grains. Seafood also recently exceeded beef in total global protein consumption, of which aquaculture produced half of the fish consumed worldwide, a share that is anticipated to increase as methodologies and technologies improve. In fact, farmed fish are considered the ultimate food security solution to increasing global population. Although wild capture and aquaculture currently contribute equally to address global demand, wild capture is fixed, increasingly endangered and regulated, such that the aquaculture industry must satisfy 100% of future growth. As a result, the demand for aquaculture feed is projected to surge between 2016 and 2025, as operations intensify and require larger volumes and enhanced quality in feed sources. Ultimately, these factors have combined to drive the aquaculture industry to the verge of a major industrial disruption, as wild forage fish, a primary source of aquaculture feedstock, are threatened and collapse with increasing frequency. Clearly, numerous innovations must be made to enhance the economics and feasibility of aquaculture. In particular, a sustainable and affordable feedstock alternative is urgently needed. New approaches should also address ease of production as well as a formulation that fish find appetizing and that meets nutritional standards for the fish and ultimately, human consumption. The Kepley BioSystems Inc. (KBI) team has envisioned an innovative, costeffective method to grow worms as a fish meal replacement: That is, to take a precisely timed, mature worm, purge the stomach contents, and replace that void of ~70% volume with an “enriched pabulum” in an automatable step for rendering the lively worm into a capsule of dense nutrition. The search for an efficient “delivery mechanism” in this context has focused on the elegance of “wiggling worms” as historically proven to tempt carnivorous fish to the hook as bait. Using invertebrates like worms (annelids) as a high-value aqua feed may prove to be a valuable approach to replacing fish meal if produced economically and with the requisite nutritional balance. Worms are comprised primarily of elongated, empty stomachs, rather than flesh, per se (~ 30% flesh and ~ 70% empty stomach). The rationale for growing and engorging worms with a finishing pabulum addresses many producer and consumer problems. With optimization, worms would provide a sustainable supply of self-perpetuating, dense protein casings capable of holding a bolus of nutritious payload. A specialized, final “fattening phase” of low-cost, powdered milk, eggs, and algae fed to worms would be expected to yield higher assimilation in fish reared on pre-digested proteins delivered in the intestinal tract of worms. In contrast to currently available aqua feeds, the nutrients and probiotic environment inside the worm would not be subjected to inactivation through processing (e.g. pelleting, incineration, expansion, or extrusion), loss by leaching, or require costly additives. The hypothesis of using invertebrates to replace fish meal feeds also has historical precedence, as insects, annelids and larva have been employed in various countries and life stages, e.g. live feed is essential for early stage development for fry and juvenile fish. Aquaculture is technically demanding, and success requires an understanding of the dynamic conditions that influence a farm, as well as the economics of feedstocks. 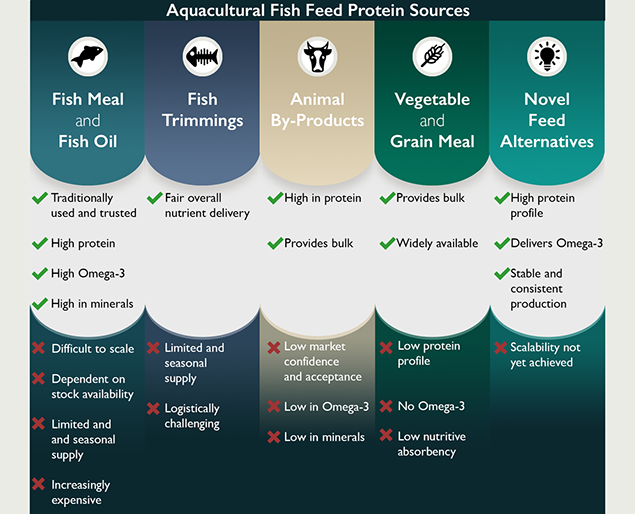 Currently, aquaculture feed is produced commercially using internationally traded commodities including: fish meal, fish oil, rice, soybeans, corn and wheat, for which it competes in the global marketplace with pharmaceuticals companies, the fishing industry, terrestrial farming, companion animal food, and direct human consumption. Subject to market changes and volatility, research shows that in the last ten years the prices of fish meal and fish oil have increased by as much as 250%, impacting the entire industry. Particularly vulnerable, small-scale and rural farmers have suffered most, further contributing to their poverty and susceptibility.